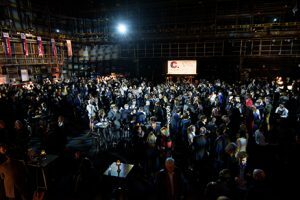 The Creative Industries Federation (CIF) celebrated their first anniversary this month, with more than 500 people packing into Television Centre, West London, to hear the Chancellor George Osborne hail the value of the creative industries and endorse the importance of public investment. 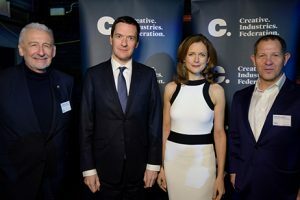 The Chancellor was the key speaker at the event, which was attended by leaders of the UK’s arts, creative industries and cultural education – having given endorsement to the Federation and the creative industries at its launch a year ago. “When we made the decision just a month or so ago, not just to increase spending on the Arts Council and on our national museums and galleries at a time when we were cutting spending in other areas, it was a conscious choice,” Mr Osborne said. Mr Osborne offered “a big thank you” to arts and creative leaders for the choices they made in creating great works of art in a period of “incredible creativity” to rival the ambitions of the Sixties when the country was dominating world culture. Opening the evening, Federation Chief Executive John Kampfner stressed the importance of the arts and creative industries at the heart of British life and what defines the country internationally. “It is the centrality argument – that the arts and creative industries are not something soft you do on a Saturday night. They are the heart of everything we do, of every community and individual’s well being. They define our global reputation,” he said. The Creative Industries Federation is the representative body of UK arts, cultural and creative industries. As a membership organisation, the Federation represents the views of the UK’s creative industries, while challenging and assisting the sector to stay ahead of the international competition. The DBA is a founding supporter of CIF, recognising the value the Federation can bring as a strong and fearless advocate across politics, policy-making and the media as a unified voice for the creative industries. The DBA’s CEO, Deborah Dawton sits on the Advisory Council of the Creative Industries Federation, providing ongoing policy advice and input to the organisation’s small but growing team, alongside her fellow Advisory Council Members. For more information on the Creative Industries Federation visit: www.creativeindustriesfederation.com.